There are many things to say about Back-A-Yard, all of them glowing. The atmosphere is warm, friendly, and interesting; the restaurant is located directly across the street from a validated parking garage; several San Jose theaters and entertainment spots are located within walking distance. However, most importantly, Back-A-Yard features a selection of incomparable Jamaican barbecue dishes and sides, making it one of the best restaurants in San Jose. The menu has a decent selection, most of the entrees falling into one of several large categories. The first is various protein selections (including tofu for vegetarians) covered in Back-A-Yard’s signature jerk sauce. The sauce is spicy, but not so hot that it drowns out the complexities of the flavor. 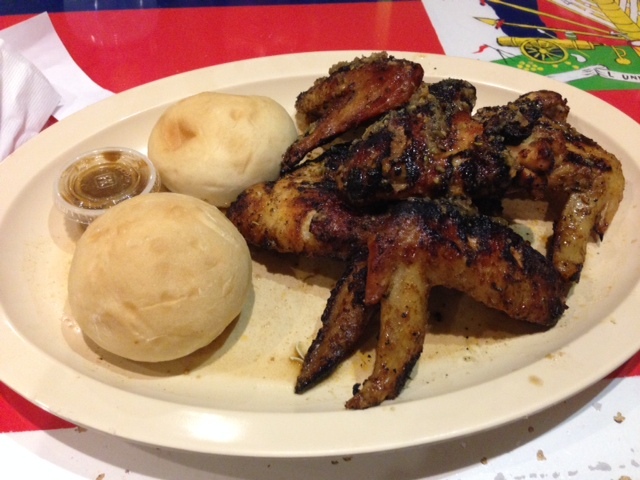 The jerk chicken ($9.75 with rice, salad, and fried plantains, or $7.95 a la carte with bread) is the more traditional option, and certainly worth ordering. There are also several meat options that use a thick, sweet house barbecue sauce, including fall-off-the-bone spareribs ($12.45 for five pieces). Additionally, there are sandwiches, a selection of fried fish, and a rotating menu of more obscure Jamaican dishes like curried goat and beef oxtails ($13.25 to $16.25, check website for availability). It is important not to ignore Back-A-Yard’s selection of sides. If you are ordering one of the jerk dishes, it comes with some fried plantains; if not, I highly recommend ordering them separately ($2.75). The plantains are firm, rich, and slightly sweet, and once you start eating them it’s hard to go back to the rest of your meal. Also worth considering is the delicious rice and beans ($2.75), dashed with coconut milk to give it a pleasant aroma and mouthwatering sweetness. Some of my fellow diners at Back-A-Yard have made entire meals out of side dishes. Save room for dessert, too, especially the incredibly satisfying sweet potato pudding ($3.45). Back-A-Yard is the personal project of Robert Simpson, a formally educated chef who previously worked in executive positions in hotels across the world. By establishing his own restaurant, Simpson was able to bring the flavors of his native Jamaica to several locations in California. After eating at Back-A-Yard, you will find yourself thankful that he made this decision.